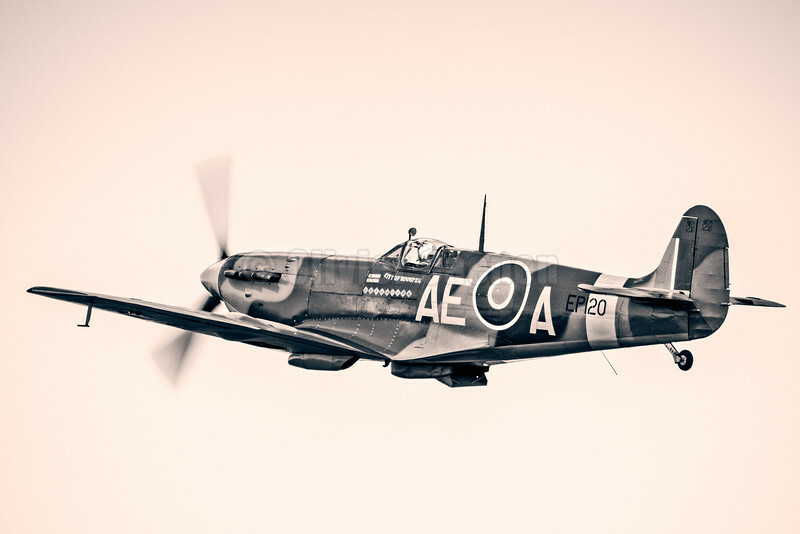 Our Mk.V Spitfire is one of the most credited historic aircraft left anywhere in the world with an impressive SEVEN confirmed kills. EP120 was built at the Castle Bromwich factory where she was probably test flown by the legend that was Alex Henshaw. She was taken on charge by the RAF in May 1942 with 45 MU at Kinloss in Scotland. She was assigned to 501 Sqn the following month and scored six of her confirmed kills with Sqn Ldr Geoffrey Northcott at the helm. A ground collision saw her returned to Castle Bromwich for repair following which she was allocated to 19 Sqn in Cornwall. In April 1944 she was taken on charge with 402 Sqn ‘City of Winnipeg’ RCAF, coded AE-A, which are the colours she wears today.